The overmen are extremely cool and their powers and personalities lend themselves to some very cool roleplaying moments. It also gives players some very unique opportunities for Talent-on-Talent combat, which those familiar with the game mechanics and the use of Will to counter other Talent powers know can be more like playing a game of chess than straight up combat. The temporary allies in Donar’s Hammer also are very cool, and show some of the difficulties in soldiers on the same side but from different countries and backgrounds working together. Sicily itself is well-presented, and though I’ve never been to the country, the module gave me a good feel for what it was like during the 1940s and the backdrop of war. As always, the guys making “Godlike” really seem to know their history, and it shows in the details. Though I don’t want to give away too much of the plot, the action starts off with a harrowing late night parachute jump in stormy weather. This opening scene actually is a great intro for starting players, because it shows how the One Roll Engine (ORE) works in conflicts and how the results of the dice, both the height and the width, affect the consequences of a scene. It also means your characters could make the mission a lot harder on themselves with some botched die rolls early on, which might require some GM fiat if things go particularly bad. One of the things I really like about Godlike supplements and modules is the introduction of additional or optional rules. In the case of Donar’s Hammer, the module includes rules for handling squad-based combat. With ORE, combat can sometimes get bogged down when handling multiple individuals in the same battle. With the optional rules, each side chooses a single character to represent them in combat, with additional dice assigned based upon supporting personnel. The action can still be described with multiple actions and opponents, but sides are working toward specific goals rather than just slinging dice at one another. Not all players are going to be happy with this, and will instead want to play it out as smaller, one-on-one battles between characters, which is why its presented as an optional rule. There also is an optional rule for handling interrogations. This plays a fairly big role in Donarás Hammer, because there are moments when player characters need key bits of info from unfriendly NPCs and one of the quickest ways to get it is through torture. One of the things I like about this rule is the loss of Will for those doing the torturing. The idea is it can be difficult for all but the most hardened souls to inflict that kind of damage and torment on another human being, and it helps make it more distasteful for the player because there is a cost in-game to using such tactics. Last but not least, Donar’s Hammer gives rules for converting games from ORE to the D20 system. Personally I think you lose a lot of the personality of the game with the conversion, but the rules seem solid and for those who absolutely love D20, it’s worth the price of admission. 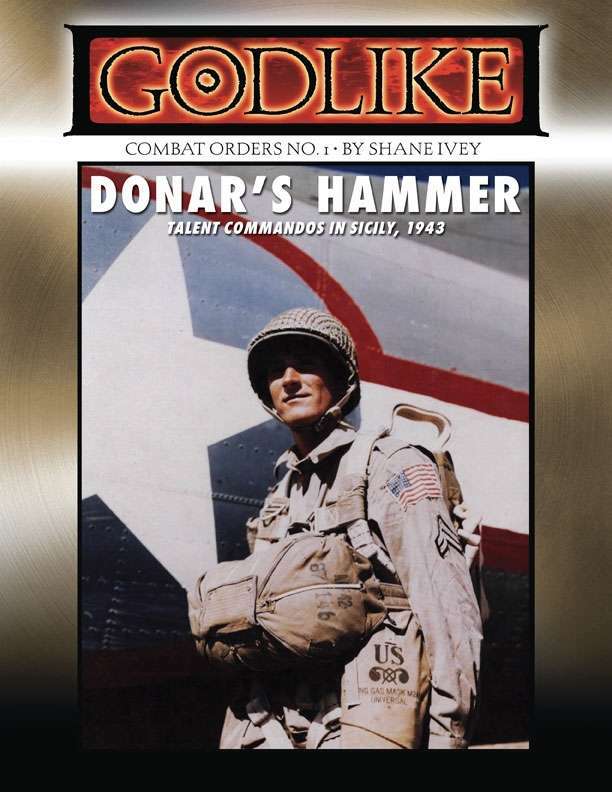 Altogether I would recommend Donar’s Hammer to anyone who plays Godlike. It is an excellent introductory scenario, but challenging enough for a group of veteran players. The optional rules also are rather good and a welcome addition to the core book. Look for more Godlike eBooks at the Flames Rising RPGNow Shop.